Bashar Assad Tells AFP That Chemical Attack Was Western 'Fabrication' : The Two-Way The U.S. intelligence community is confident the Syrian president used the nerve agent sarin against civilians. Assad, in an interview with the wire service, claimed the evidence is all fake. Syrian President Bashar Assad speaks in an earlier interview with AFP, in February 2016 in Damascus. Syrian President Bashar Assad continues to deny responsibility for a chemical attack in the town of Khan Shaykhun, claiming the attack was "100 percent ... fabrication" and video evidence showing choking victims is "fake." He told Agence France-Presse this week that he wasn't even confident the dead children shown on video were "dead at all." The U.S intelligence community says it is confident that Assad's forces used the nerve agent sarin against civilians, killing scores of people and numerous children. White House officials say they drew on reports from aid agencies, video evidence, laboratory analysis of samples from victims and classified intelligence to draw that conclusion. Other world powers have also condemned Assad for the April 4 attack — although Syrian ally Russia continues to maintain there is insufficient evidence Assad carried out the attack. Syria and Russia have suggested a conventional airstrike by the Syrian army may have hit a depot storing chemical weapons possessed by extremists. Experts tell NPR this explanation does not make sense, based on the nature of the chemicals used. And U.S. analysts say the timeline and strike location suggested by Russia don't match reports from the ground or satellite imagery. 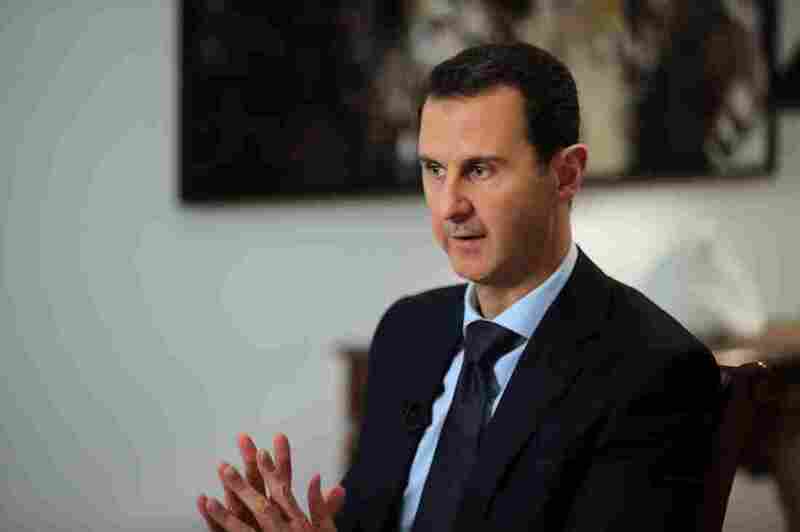 But Assad doubled down on his denials in the interview with AFP, conducted on Wednesday and published on Thursday. He didn't just point a finger at rebels — he suggested it was "not clear" if the attack happened at all or was entirely manufactured. "Our impression is that the West, mainly the United States, is hand-in-glove with the terrorists," Assad said, according to the wire service. "They fabricated the whole story in order to have a pretext for the attack." "You have a lot of fake videos now," he said, according to AFP. "We don't know whether those dead children were killed in Khan Sheikhun. Were they dead at all?" In the interview, Assad insisted his regime gave up all its chemical weapons in 2013.